It’s pretty fascinating how one simple trick or suggestion can bring on hot discussion, hope you can share your idea in our community on how to record iPhone screen, or you can send words on what you wished for the coming topic. 1. Anyone who leaves message here can get a Yearly VIP Account for All Apowersoft Products including phone manager, screen recorder, phone mirror, video editor and many others. All these can impel us to go forward. I’m using iPhone 6 without updating to the latest iOS 11. To record my iPhone screen, I often use QuickTime Player on my Mac, but I don’t think it’s convenient because sometimes I cannot get the cable by my side. Thanks for sharing your story! We have activated your email as VIP account for using Apowersoft Unlimited (All Apowersoft Products). Please check your email box to find the login information. Glad to hear this good news! Haha. ? I started my gaming channel on YouTube a year ago and I used to record my iPhone screen by using QuickTime Player. The process is a little troublesome for me. ? I need to connect my iPhone to Mac PC by using a lightning cable, run QuickTime Player, click “File” and select “New Movie Recording”, select my iPhone in the drop-down menu, click the “Record” button and then I can start to record my gameplay. Here is my email address: sfjheyrdf@gmail.com. I just tried your iPhone/iPad Recorder, it’s amazing! I like it! So quick and easy! Sincerely I would like to share this good news with my friends soon!!!? Thanks for your love for our program and sharing your story. We have already renewed your account as VIP. Please download the program and log in using the email address you mentioned. Oliver reply to Apowersoft : Thanks a lot! I love you. Hahha. ? I just bought iPhone X with iOS 11, and it’s my first time using iPhone. Previous Android. I love playing games and sometimes record my game and share to my friends, but the built in recording cannot show the recording time like my old huawei and when the phone is displayed in horizon, I have to quit the game to end the recording. DON’T LIKE IT! ? I wish you can share some better solutions for iOS 11 recording. Thanks for sharing your thoughts, we have activated your account as VIP and sent you the email. As for the iOS 11 screen recording methods, you may take a look at this post, a detailed comparison table is summarized at the end of the article. Cholaco reply to Apowersoft : Oh, great! Thanks for mentioning! I received the VIP, many thanks! Keep good job? Just shared your page on my Facebook! My friends will be very happy to hear this good news too. ? Alice Wang : Hi, Swift. 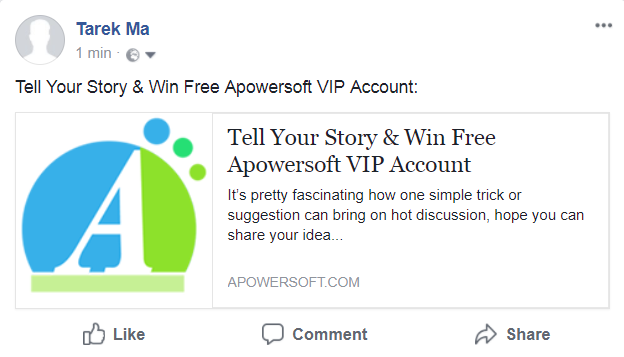 We have activated your account as VIP for using Apowersoft Unlimited (All Apowersoft programs), please restart the program and log in using this account to update the account info. I’ve liked your facebook post and would love to try out more of your programs! Alice Wang : Hi, Andoni! We have already activated your account as VIP for free and sent you an email via our support email. Liked and Shared, would love the ability to merge files between iPhones. I have yet to find a good solution. Apowersoft : Hi, Adrian! Thanks for sharing our page, we have activated your account as VIP for free and sent you registration email. I use Apowersoft to record my iPad’s screen when playing games or to transfer files between my iPad, iPhone and PC. Really like how simple you guys have made all of it. Apowersoft : Hi, Kevin! Thanks for using our program, we have activated your account as VIP for free and sent you registration email. You can check it! ? I have used Apowersoft for all of my YouTube videos. It has really improved the ways I make my videos. It is really easy to use, and I have recommended it to everyone who has asked me “What screen recorder do you use”. Thanks you for making a online screen recorder so easy and simple to use. I do not have a Facebook account, because I am currently using twitter. But I do really love your products. Thank you.?? Thank you for your great support. Yes, we have twitter account: https://twitter.com/Apowersoft?lang=en, you can follow us. And we have activated your account as VIP for free and sent you registration email. You can check it! the.onlyone reply to Apowersoft : Thanks you so much for the account. I will follow you. Have a nice day!? I have used Apowersoft Screen Recorder, Video Editor and Video Downloader. And I must say, Apowersoft software are intuitive, feature rich and nice interface. You guys are generous to do a daily promotion of your wonderful software. And now an opportunity to enjoy all Apowersoft software for a full 1 year for free. I have liked Apowersoft social media accounts. Apowersoft : Hi, thank you for your comment. We are happy to know you love our programs and followed us. We have activated your account as VIP for free and sent you registration email. You can check it! I like the daily promotion you are doing, it is very good. Apowersoft : Hi Tarek, thank you for your suggestion and great support for our products. We will take this into consideration. BTW, we have already activated your account as VIP for free and sent you an email via our support email. Please check it. Hi Crink, we have activated your account as VIP for free, please check that in your email. Hope you can make great work for the non-profit organisation. You are very welcome, Crink. Hope you and your teammates can enjoy our program and achieve more and more great and creative work. ? Hello I want to use apowersoft to Recover my important files ( some notes). Could you send me vip account?cause i heard apowersoft manager fast and succesfully program. Hi, what program do you want to use to recover your files? ApowerManager? Have you backed up your files to the computer before? Our ApowerManager program can only restore the previous backup files to your phone. If you haven't backed up them, then I'm sorry to tell you that it cannot help you. I am currently using an IPhone 5 with data, but Wi-Fi is not available for the laptop. I searched several sites to determine that I need to mirror my iPhone to my laptop. I would love to be able to utilize the mirroring option without by hardware. Please try ApowerManager. It allows you to mirror iPhone screen to PC via USB.